Capoeira is, as you people might have heard a lot, a conversation (among other things). And in Capoeira Angola this is even more true than in other forms. With this post I won’t go into the technical play itself, because that is something everybody learns, when he is training Capoeira. I want to put the emphasize on the little details, which makes the Game not only nice, or very good, but beautiful and entertaining. Why do I make such a difference? Well, let’s say in recent times I have seen a lot of Capoeiristas who have a really good play in the Roda. They are fast, have technical abilities beyond my own, have good reflexes and are generally more athletic than I am. So when you watch them playing, yes, you will say “it’s a good player”. But some of these players were lacking something. Something which is not directly bound to the movements they learn in everyday’s classes. Now do not jump on my throat. I am not trying to show off here. I know that there is still a lot I have to change with my game, too. And compared to the expressive games of some people I met in the Roda I am as expressive as a fridge. And I am also not telling that only Angoleiros can play an expressive game. That wouldnt be the truth. 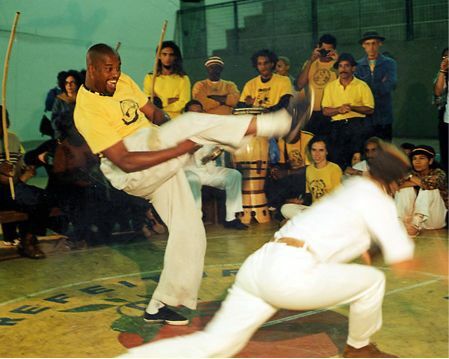 What I am saying is that in Capoeira Angola there is a lot of emphasize in expression – and that expression does sometimes make the difference between a nice and a beautiful game. We should now come down to the question: where is the places where you can express yourself and what are the things you can change? Basically there are two possibilities, where you can express yourself in the Roda: while playing music or while playing the Game. It does not matter if you are standing in the Chorus or at the Bateria, all you should and have to do is: give everything to make the music beautiful. This reminds me of one sentence my first teacher told me: “You are not making music for yourself, but for the ones who are playing in the middle.” This does mean two things. a) try to make nice music. I know, not everybody is born with a talent for music, neither am I (actually in school I wasn’t even allowed to play the triangle because I was disturbing the class!). The best thing you can do is just give your best. Try to sing the way you hear your Mestre sing. Try to sing the way you hear it on CD’s and so on. Do practise singing and playing the instruments, because you will not be able to play beautiful music when you are not even able to play the berimbau. If you sing, especially if you take the lead, do not mumble something. Sing out loud. And even when you are just able to keep this up for 15 seconds, those 15 seconds are worth more than 5 minutes of mumbled singing. But there is also the second meaning of the things my teacher said. If you are playing music, do not get lost. I know of some pretty good Berimbau players who, once they get the Viola, can play variations I never heard of. And keep up variating for half an hour without getting back to the basic rhythm (at least that is what it seems to me sometimes…). But the same person did sometimes get lost in his own music. He was not listening anymore, he was not watching anymore, he had his eyes closed and was playing his really nice music, which was just not fitting to the rest of the Roda. Never forget that the music is the sum of all the musicians in the circle. The situation is different inside the Roda. There we only have two players. The Game is the sum of his/her and your actions. Thus, you can make the difference in playing a beautiful, expressive Game. How? The second thing you can change is your facial expressions. You might say this is ridiculous? It is not. Even if you would not care about the beauty of your game you have to understand that your face does tell tales. A Jogo de Angola is full of little pitfalls, full of fintas and full of malicia. An ability Angoleiros have to develop is reading your partner. An unwritten law in Capoeira is that you should watch the face of your partner while playing. Why? If you only concentrate on the body movements of the person, you will exactly see the movements coming when they are coming. Add your own personal reaction time and you will see that you have not much time left to respond. Especially if it is an unexpected and dangerous movement. When watching the face of your partner and when you are able to read the face then you will see the kicks coming before the legs even started moving. You might even see which kick will come next, and where it is going. I am not kidding you. It is possible, you just have to watch. And if you meet a person who can read faces then you have a serious disadvantage if you do not manage to hide intentions. Do not stare at the place where you are kicking at. Do try to develop a poker-face, never revealing when you are going to kick. Smile at your partner, just a millisecond before you are playing the worst martello you have in your arsenal. This is a tactical advantage. And it is more than that. It is so enjoying to watch a person who has perfect control over his facial expressions! The smiling, the laughing, the fear, the grudge, the relaxation, the concentration. All of these are beautiful to see, especially if they come in variations. And it is even better when both players do this. When they communicate. It is then like watching a street theater, where the players try to tell us a story, a story which is just being created in the roda. This is some kind of extra and very important for Angoleiros. 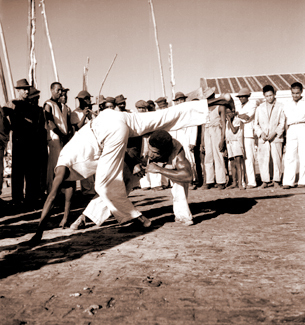 I will not go into the details of different rituals you have in Capoeira Angola. Learning and using the rituals of Capoeira Angola is of high importance for an expressive, beautiful Capoeira Angola game. There is the mysterious and obscure part of Capoeira Angola, which does have his own fascination if shown in the Game. When you are a player of modern Capoeira and you show that you have knowledge of (some of) the rituals, you are much appreciated. It is knowledge which is not farspread, even among Angoleiros. And having seen them and imitating is something different than using them in the right timing and with the right expressions. 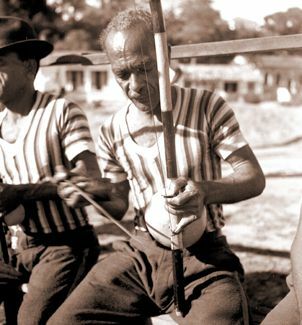 What I refer to are the rituals at the Pé do Berimbau, the Chamada in the Game and some of the less known rituals taking place during the Game. I will not get into details (for now), but I thought the list would be incomplete without the rituals. But beware, also here you have the same as while playing music. You are not alone. You have your partner in the Roda. Even if you do not like that particular person, your game can only be beautiful if you do integrate him/her into it. If you do a one-man-show you have two possible bad outcomes. a) People might think it’s entertaining, but they will also think that you are a show off and egocentric and so on. b) The person you are playing with might not be happy with this. And if he is able, he might even show you that he does not like your One-Man-Show. So, as always in Capoeira Angola, be careful. Do take care of your game, do try to play expressively. Do try to play a beautiful game with all the music, the expressions and the rituals, but do never forget that you are not alone and that Capoeira is something that only does work TOGETHER! And now, I will get in front of my mirror and try some funny expressions.